Best DRM M4V to Android Video Converter on Mac – How to Sync iTunes M4V to Android? NoteBurner M4V Converter Plus:Convert DRM M4V movie rentals and purchases to sync to Android devices. How to Sync iTunes M4V Movies to Android? How to put iTunes M4V movie to Android devices? Numbers of people have similar question about transferring contents between iTunes and Android. Android has taken the place of Symbian to be one of the most popular OS of the smart phones as well as Apple’s iOS. Meanwhile, with more and more android tablets released, the number of Android users has rapidly increased in 2011. 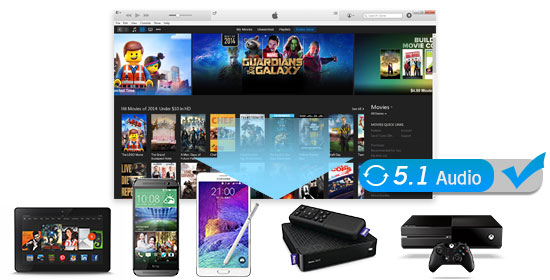 So, if you are used to downloading and purchasing movies from iTunes, it may be a challenge for you to enjoy iTunes M4V movie on Android Phones/tablets like Samsung Galaxy S5, Galaxy Note 10.1, and Amazon Kindle Fire HD. It is all due to the DRM protections in those iTunes M4V movies. Apple only allows you play your iTunes purchased movie on Apple devices like Mac, iPad, iPhone and iPod. If you want to put DRM M4V movie to Android tablets for playing, you need remove DRM from those iTunes movies first. It sounds much complicated to fulfill the task. NoteBurner aims to help you simplify the conductions and makes it possible to play iTunes DRM movie on Android devices. NoteBurner M4V Converter Plus (For Mac & For Windows) – best DRM M4V to Android Video Converter. With this powerful DRM remove tool, you can easily import and remove the DRM from iTunes M4V movies and convert them to all kinds of common video formats like MP4, AVI, MOV, WMV and etc. And then you can sync iTunes M4V to Android devices for enjoying, including Samsung Galaxy S 3, Galaxy Note 10.1, and Amazon Kindle Fire HD. Step 1. Install NoteBurner M4V Converter Plus. Please download this useful tool on your Mac pc or Windows PC. Step 2. Import the iTunes M4V movies. Launch the iTunes M4V to Android tablet converter and then click the add button to open the library of iTunes. Then select to choose the M4V movies from the library. 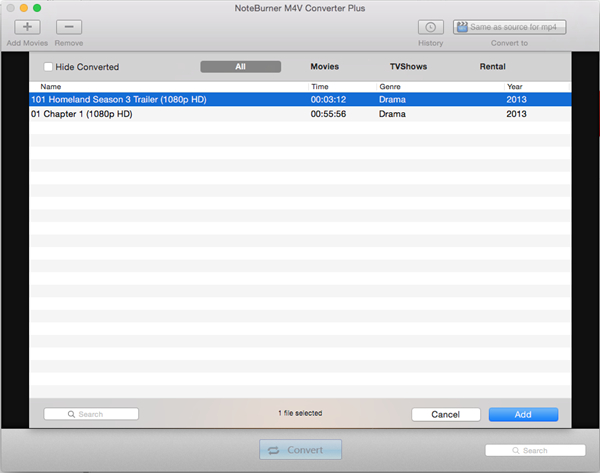 NoteBurner M4V Converter Plus supports both iTunes M4V purchases and rentals. Step 3. Choose output format and adjust the profile. To convert iTunes M4V for Android tablets playing, you need choose the particular output format in format drop menu. If there is not the particular profile for your Android device, you can choose Customized MP4 Movie (*.mp4). After that, you can also change the settings of the profile such as video size, bitrate, codec, and etc. Step 4. Start to transcode DRM M4V to Android compatible videos. Click the convert and the iTunes M4V to Android video conversion will begin at once. After the conversion finished, you can freely sync iTunes M4V to Android devices for playing. What's next? Download NoteBurner iTunes Movie to Android Converter now!